Heat pump water heaters offer significant savings, cutting water-heating energy consumption by 50 percent compared to a standard electric water heater. Three manufacturers are offering rebates that bring down the cost of this new technology, and all qualify for Chelan County PUD rebates. Through May 28, GE is offering a $300 instant markdown on the 50-gallon GeoSpring. The GeoSpring is available at the Wenatchee Lowe’s. The markdown makes the out-the-door price as low as $699 (individual pricing may vary). The PUD rebate shaves off another $300. Through June 10, The Home Depot is offering a $300 markdown on the 50-gallon Rheem EcoSense (HB50ES). This unit is not available at the Wenatchee store but a quick search of the company website showed availability in Seattle. Consumers should check with the local store to determine whether the EcoSense can be ordered online and shipped locally. The GeoSpring and EcoSense are Tier I heat pump water heaters. While professional installation is recommended, homeowners can follow do-it-yourself guidelines to install the units themselves. Through 2014, AirGenerate is offering a $500 rebate on its heat pump water heaters (models ATI66, ATI66DV and ATI80). The rebate can be redeemed through an online processing portal on AirGenerate.com. Chelan PUD’s rebate is an additional $500. These units, which are Tier II units, require professional installation by a plumber. They are not available locally but can be ordered through GenPac. Type – Tier 1 units are well suited for unconditioned spaces, such as garages. Tier 2 units are well suited to colder climates and can be ducted to move cool air generated by the unit to the outside, allowing for installation in conditioned and unconditioned spaces. Space – Tier 1 units like the GeoSpring and EcoSense require at least 1,000 cubic feet of air-flow around them. This is the equivalent of 10′x10′x10′ of space. Sound – Heat pump water heaters generate sound similar to an electric fan. If your existing hot water heater is silent, this may be bothersome at first. Cold air – While in operation, heat pump water heaters release cool, dry air into the surrounding space. Size/height – Heat pump water heaters are slightly larger than standard electric water heaters. Learn more about heat pump water heaters at smartwaterheat.org. Click here to find a contractor. Apply for Chelan PUD’s rebate here. Windows, doors, ductless heat pumps, water heaters, appliances… Don’t buy any of these this spring until you’ve checked out our rebates. Why did the chicken cross the road? 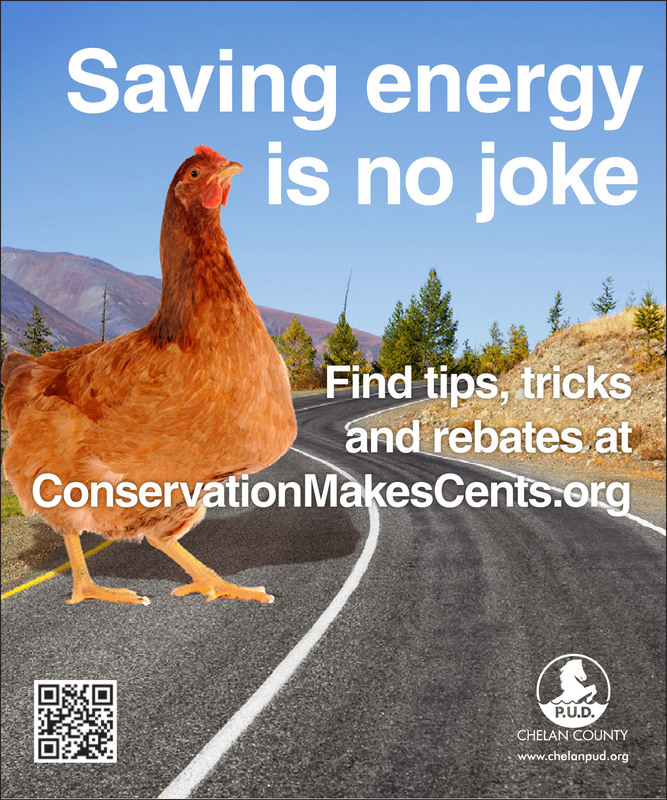 To get to Chelan PUD’s energy-saving rebates! Manufactured home duct sealing – free! Check out the details for each program using the links above. Or call us at (509) 661-8008. Enter a drawing to win a free, expert evaluation of potential energy savings in your home at the KPQ Home and Garden Show March 14-16 at Town Toyota Center. Chelan PUD is hosting a booth at the show to spread the word about how to save on electric bills. The PUD is introducing new incentives for homeowners including rebates on air-source heat pumps, electronics’ surge suppressors, super-efficient windows, exterior doors and energy-efficient manufactured homes. For businesses, new programs include rebates on heat pump water heaters, commercial clothes washers, commecial dishwashers and ductless heat pumps. 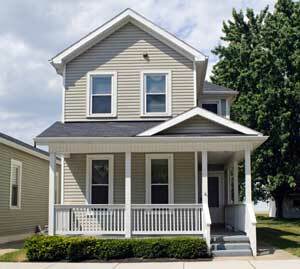 An energy audit identifies trouble spots where a home may be wasting energy. One lucky winner will receive a free energy audit from Greg Jourdan of Jourdan HVAC/R Consulting, Wenatchee. Jourdan will check insulation, inspect the furnace and ductwork, and use diagnostic equipment and a thermal imaging camera to pinpoint trouble spots. Following the evaluation, Jourdan will suggest measures the homeowner can take to upgrade energy-efficiency, saving money on electric bills and improving home comfort. The energy audit is valued at $300. You must be a Chelan County resident to enter the drawing. Chelan PUD is among more than 150 exhibitors who will set up displays inside and outside the center. Learn the latest in home construction, landscaping, decor and green living. Show hours are Friday, March 14, noon to 7 p.m.; Saturday, March 15, 9 a.m. to 7 p.m.; and Sunday, March 16, 10 a.m. to 4 p.m. Admission is free. Now here’s something to look forward to in 2014: Our rebate programs on energy-efficient windows, insulation and appliances will continue. All of Chelan PUD’s energy-efficiency programs — including recycling of old refrigerators and freezers — will continue in 2014. This past year was one of our best ever for conservation, with nearly 400 customers adding energy-efficient windows and/or insulation to save money and improve the comfort of their homes. Check out what three satisfied customers say about their energy-saving improvements in this video. In the last four years, Chelan PUD has saved 7.3 average megawatts through conservation efforts — enough to power about 2,940 local homes. We’ll continue to offer refrigerator and freezer recycling next year, too. Our contractor will haul away and recycle old refrigerators or freezer at no charge, plus provide a $30 rebate. The PUD also offers free duct testing and sealing for manufactured homes. GE, maker of the energy-saving GeoSpring heat pump water heater, is partnering with the Smart Water Heat organization and local utilities to offer big discounts through local retailers this fall. The GE GeoSpring 50-gallon heat pump water heater, normally $1,199, is available for $499 after discounts and rebates. The GeoSpring can be purchased at Sav-Mart and at Lowe’s in Wenatchee. The GE promotion runs Nov. 6 – Dec. 4. Read the FAQ. The price includes Chelan County PUD’s mail-in rebate of $300. Rather than generating heat directly, the heat pump saves energy by moving heat from one place to another. The heat pump does the heavy lifting; the electric heating elements are used only when needed. Heat pump water heaters can cut water-heating energy consumption by 50 percent compared to a standard electric water heater. Customers can see up to a 10 percent reduction on household electricity bills. Smart Water Heat is an initiative of the Northwest Energy Efficiency Alliance (NEEA) focused on promoting the education, development and adoption of heat pump water heater technology that is best suited to meet the needs of homeowners in the Northwest.